I read with interest Principal Carol Burris' column on whether education groups are really listening to their members. It's interesting that the statewide PTA is deaf to the concerns of regional PTAs. When parents see their kids suffering from overtesting and preposterous high stakes, they tend to object. This is something Reformy John King learned when he actually went around the state and heard from people not contained in his particular cone of silence. Unfortunately, the state PTA leaders appear to be precisely the sort of people Reformy John hangs with, the ones who tell him that everything is wonderful and he is unconditionally a prince. And while it's clear he believes that, I'm not at all certain readers of this blog will concur. So what do you do when you have a leadership that doesn't represent you? According to Carol Burris, you vote the bastards out. That makes sense to me. Of course, for those of us in the UFT, it's another story. So few of us deem it worth our time to vote that it's very tough to compete with avid patronage recipients. To make things worse, more than half of all voting is done by retirees, who have limited skin in the game. But the very worst aspect of our voting is it's winner take all, and all dissenters, bar none, are shut out. Were that not the case, you certainly wouldn't have a UFT President not only supporting Common Core, but also publicly threatening to beat the crap out of anyone who doesn't. And whenever it appears there's some slim chance opposition may break a little sunshine into the monopolistic one-sided regime, action is taken. When Mike Shulman won UFT HS VP, they waited until he was out of office and changed the rules so those meddlesome high school teachers couldn't elect anyone who actually represented them. Now the elementary and middle school teachers help us, which ensures a Unity VP even if we choose otherwise. But that wasn't enough. 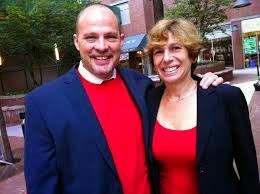 Randi Weingarten reached out to Shulman's party, New Action, and struck a deal. If New Action would only endorse her, she'd let several seats on the UFT Executive Board go unopposed. At that time, when New Action members like James Eterno refused to buy into the deal, they formed ICE, contested the seats and won them. As opposition voices were completely unacceptable, Unity then cross-endorsed the New Action candidates and made sure that no one they didn't have a deal with got any voice whatsoever. More recently upstart caucus MORE has gotten a little traction, and that apparently could not be tolerated. So Randi Weingarten met with a teacher who's now formed yet another caucus, a teacher who's already running a campaign for UFT President in 2016. So just in case MORE should catch on enough to threaten even the high school seats New Action now holds, Weingarten and this teacher have made it just that much more difficult. In my opinion, buying out New Action was one of the most effective steps our union has ever taken against democracy. Perhaps this new caucus will prove the second best. Since absolutely everyone who represents us has either signed a loyalty oath or struck a deal with the UFT Unity Caucus, there is not one single person who represents us at a significant decision-making level. Sure, we can bring things up at the DA, but we're overwhelmed by people who need to vote as told at risk of being ejected from not only their patronage jobs, but also the glitzy free trips to conventions where they reliably say nothing and represent no one. And then, of course, there is NYSUT and AFT, where we also have no representation whatsoever. I keep hearing ostensible leaders claim teachers support this and that, but they never ask me or anyone I represent. Their bad decision-making and short-sightedness threaten our very survival as union. We all hope our enemies won't kill tenure, but we have to know that whether or not that happens it's far from the end game. Leadership, in the vain hope that appeasement will keep our enemies at bay, has given in to major reformy initiatives, including mayoral control (which apparently exists only for reformy mayors), charter schools, value-added junk science, and deterioration of seniority rights and due process. Evidently, this leadership is up for just about anything. Personally I don't know one single teacher who supports any of this stuff. I suppose it is always nice to have a seat at the table. It is important, however, to be sure that those you represent are not the main course. The question remains--with leadership like we have, and a blatantly rigged election process, how do we go about changing it? How do we achieve a real representative union?